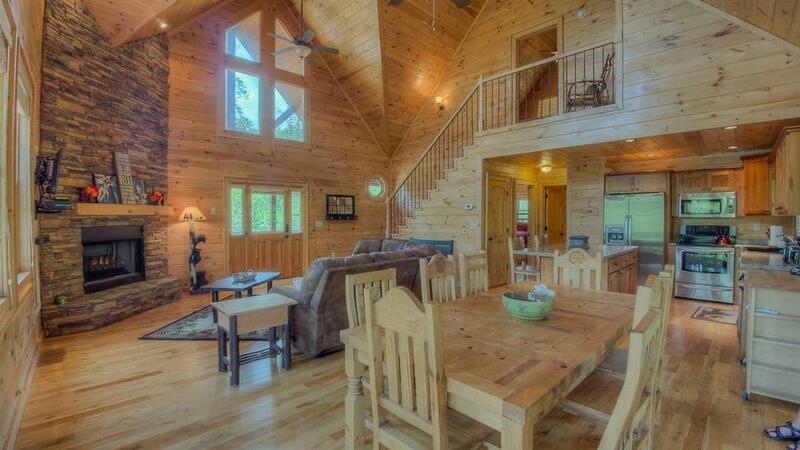 With its soaring vaulted ceilings, wraparound deck, and magnificent wooded views from every angle, the Blue Ridge cabin rental Deckin’ Around doesn’t have to work hard to impress. 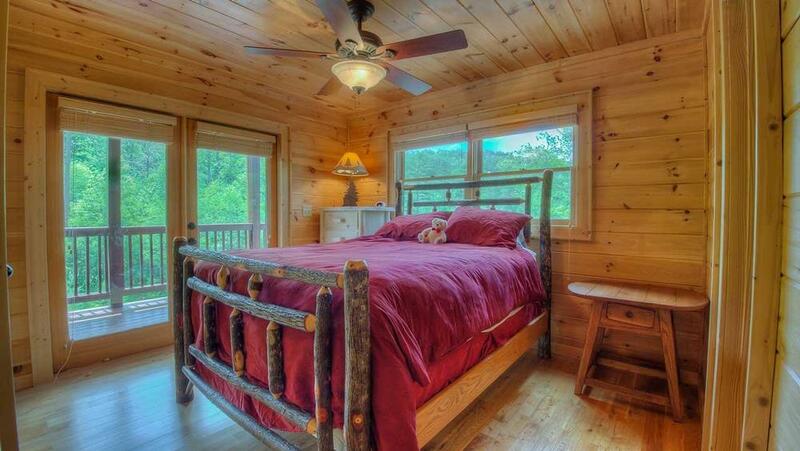 But there’s so much more to this mountain cabin, as you’ll find when you step inside. 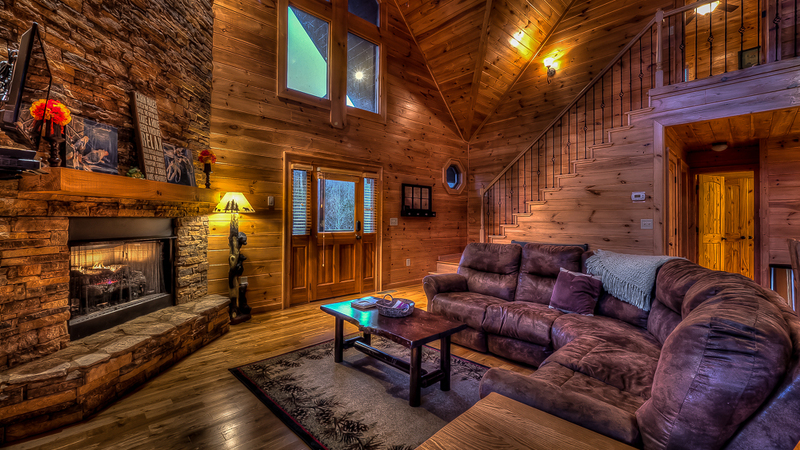 Bright, airy and spacious with ceiling fans creating soft breezes, two fireplaces to keep you warm and cozy, and huge windows that bring the outside in, the tri-level cabin is comfortably decorated in rustic casual style, with colorful touches, like the red Adirondack chairs around the fire pit and wagon wheel as wall art. Its name references the deck and reflects the sassy, playful attitude of the owners, who’ve hung funny, quirky signs above the bar in the game room. 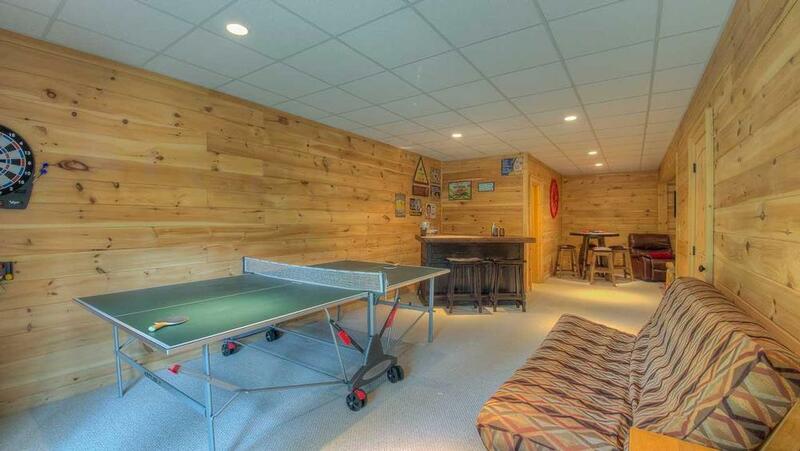 There, you can play ping-pong, darts and cards, watch TV or DVDs, or relax in the living room, where there’s another flat screen TV and an enormous couch that includes three reclining seats. 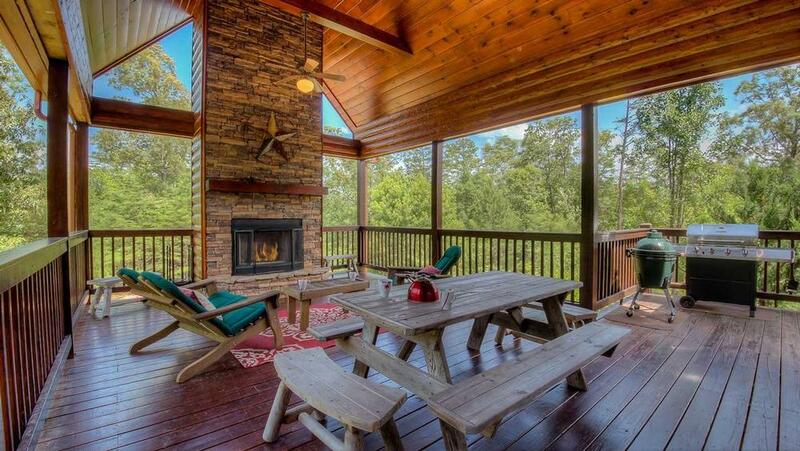 Of course, you’ll want to spend as much time as possible outside, relaxing in a rocking chair or the hot tub, warming yourself by the fire pit or wood-burning fireplace, and firing up the Big Green Egg provided for your grilling pleasure. Love blackberries? You’ll find wild blackberry bushes on the property to pick for dessert. 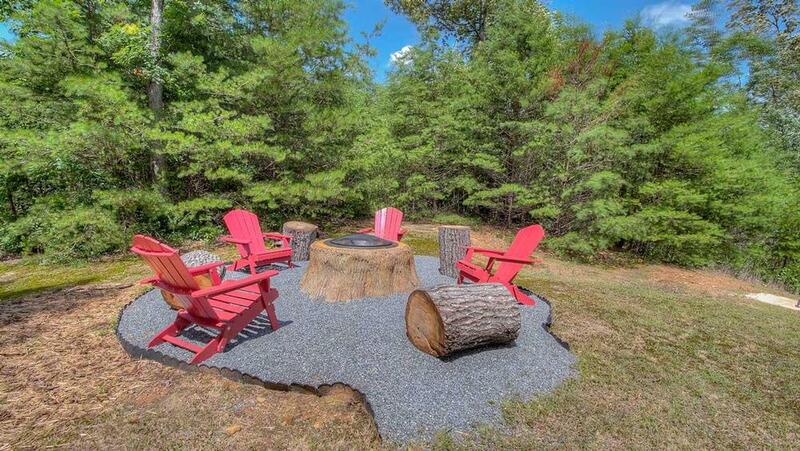 There’s also an open area for play and meditation and a horseshoe pit for a little competitive fun. 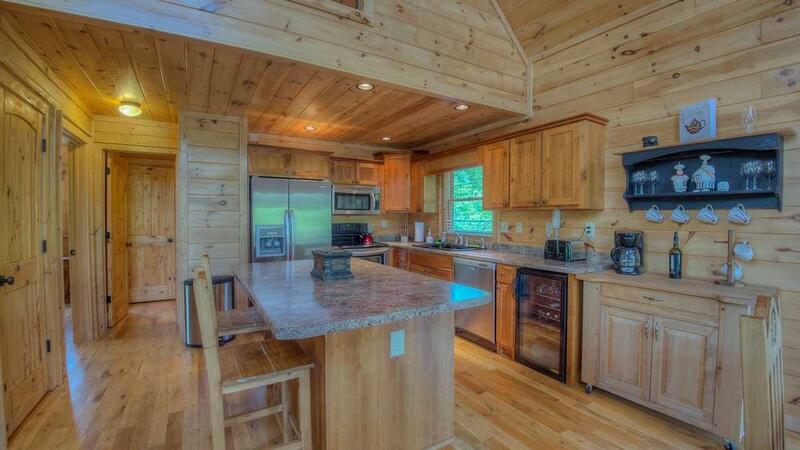 The fully stocked kitchen is outfitted with stainless steel appliances, crockpot, waffle iron, wine cooler and drip coffeemaker, everything you’ll need to prepare and serve meals. 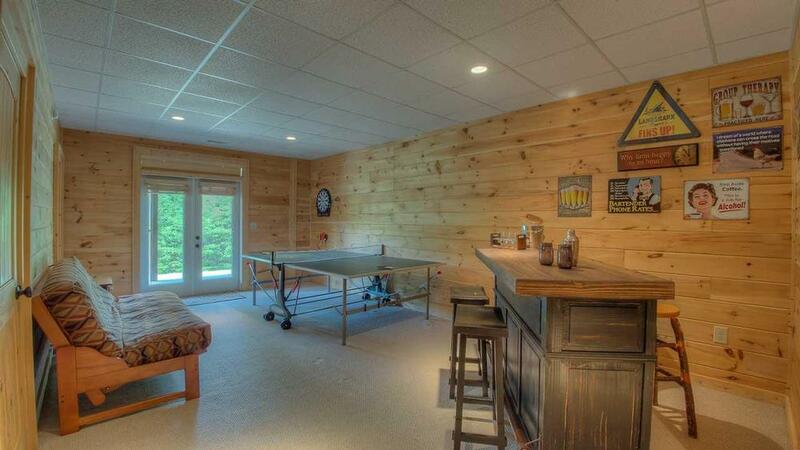 There’s room for eight at the dining table, plus two at the breakfast bar. 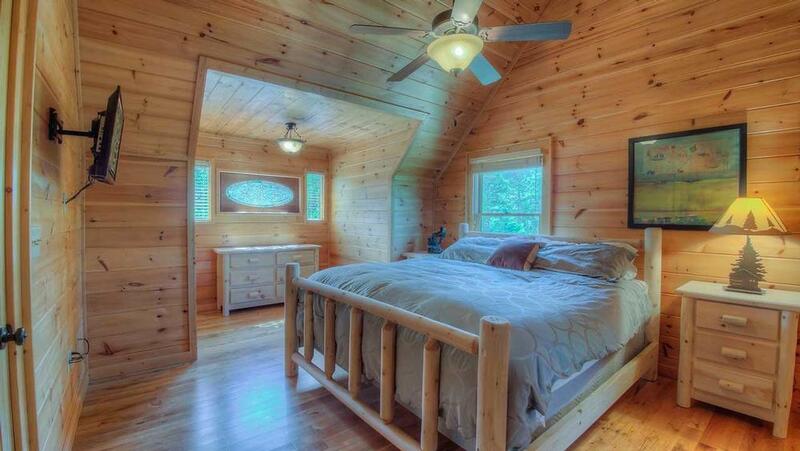 The cabin’s three comfortable bedrooms, all with rustic log beds and ceiling fans, ensure a great night’s sleep. 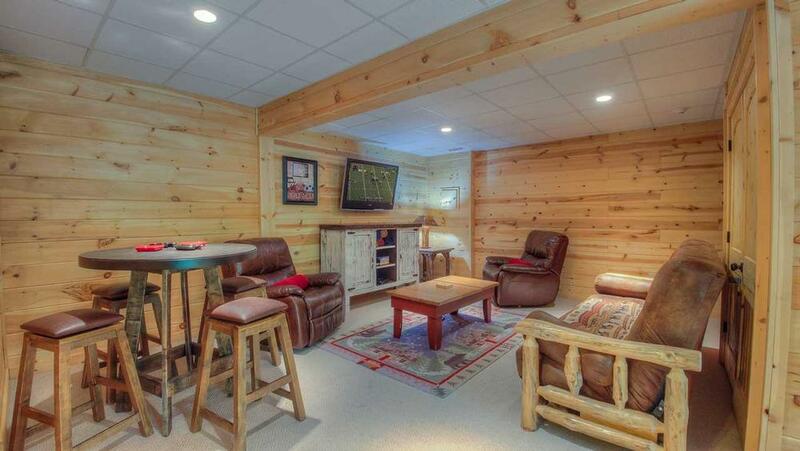 The upstairs master has a king bed, private bath, and flat screen TV. 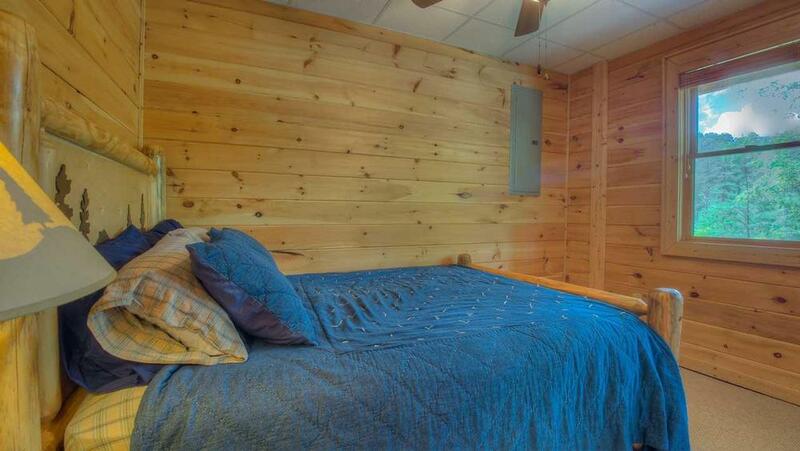 The main level bedroom has a queen bed with deck access and there is a full bed downstairs. No worries if you have a big family or extra guests—there are full and queen size futons downstairs. 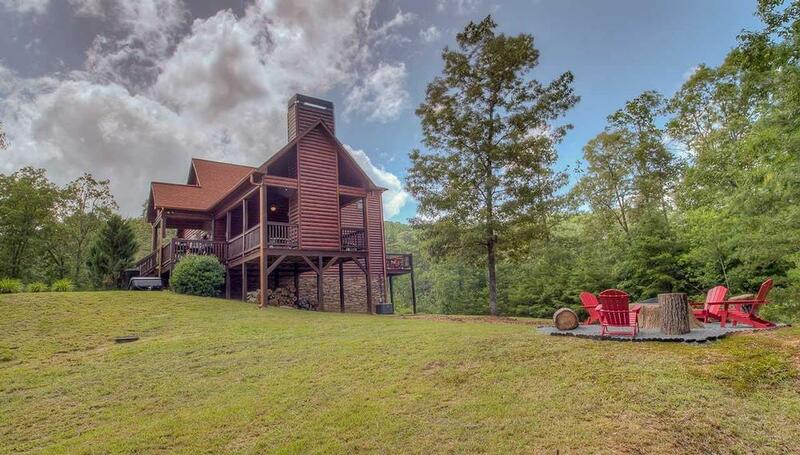 Although it has all the privacy and seclusion you crave, Deckin’ Around is just a ten-minute drive to the shops and restaurants of downtown Blue Ridge and convenient to the Chateau Miechtry Vineyard and the breathtaking natural beauty of Amicalola Falls. 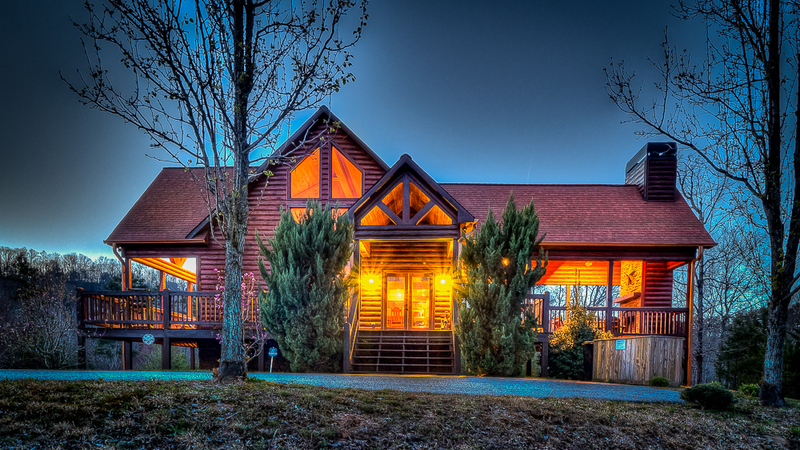 The cabin’s amenities include Wifi, DirecTV on all televisions, bluetooth radio on the main level, pack n play (in main floor closet), washer/dryer, and paved driveway. But its best attributes are intangible: the feeling of carefree comfort, ultimate relaxation, and peaceful serenity that this wooded oasis provides, and will linger in your memory long after your stay. 03/19 - I really enjoyed the view of the mountain and the utensils in the kitchen. 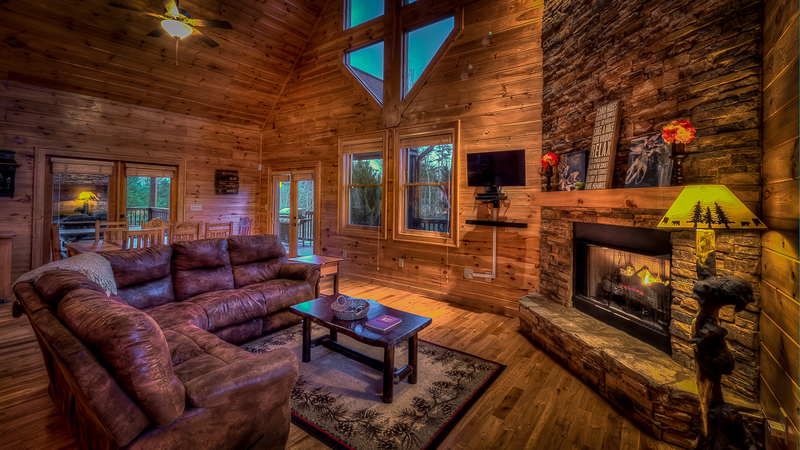 We had everything we needed.Everything about this cabin was great. 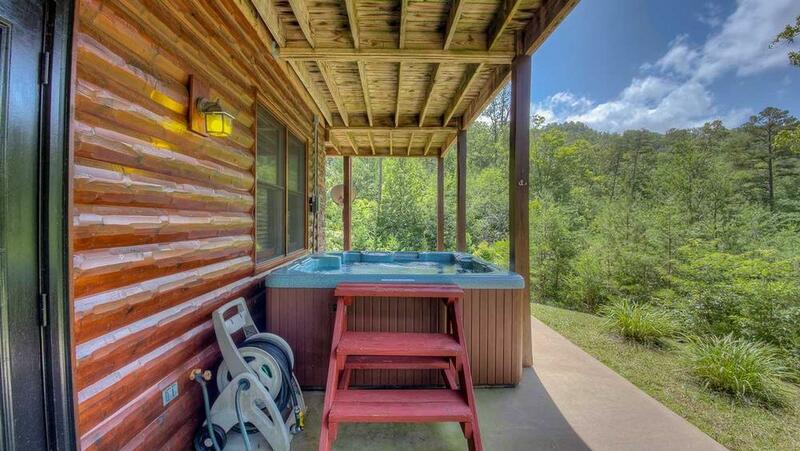 4/18 - Enjoyed the layout, amenities, outdoor fireplace, wrap around deck. I love working with Escape To Blue Ridge. We've used your company many times, and it has been a pleasant experience each time. 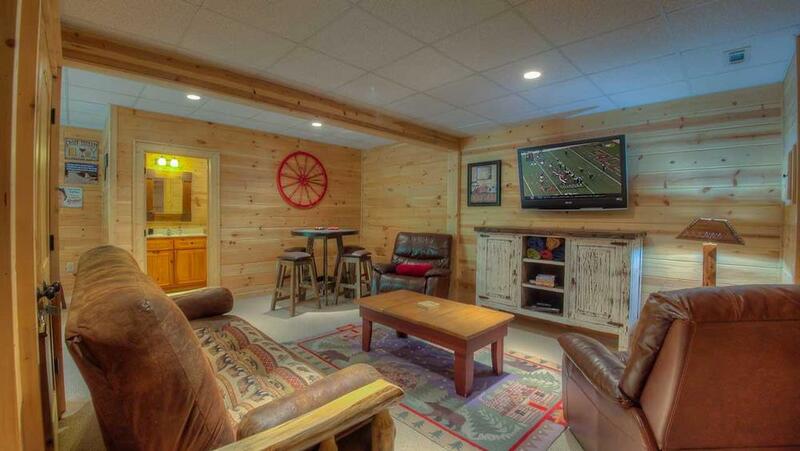 3/18 - We enjoyed the game room and the outside porch with the wood burning fireplace. The company is easy to work with. 09/17- The outdoor fireplace area was great. The kitchen was very functional and nicely appointed. The bathrooms were not large but very functional. Love the company.....we've always rented with EBR and will continue to do so. 08/17- The deck was great. Bar was fun too. Great responsiveness. 08/17- Beautiful home! It was immaculately clean and cozy. Outstanding customer service. 07/17- Beautiful home, spacious and well stocked Enjoyed the ping pong table, the horse shoe pit and the amazing covered deck with the fireplace which is where we spent most of our time. Friendly, helpful staff, very easy to work with.